A single machine solution for permanent pothole repair. HOLES is the first company in the US to feature the JCB Pothole Master! Dedicated pothole repair machines are traditionally larger milling machines meant to mill entire roads or mounted to a Skid Steer or Bobcat and meant to mill out areas in one work area. Both of the old methods require exhausting wasted time loading and unloading off a trailer and switching attachments. 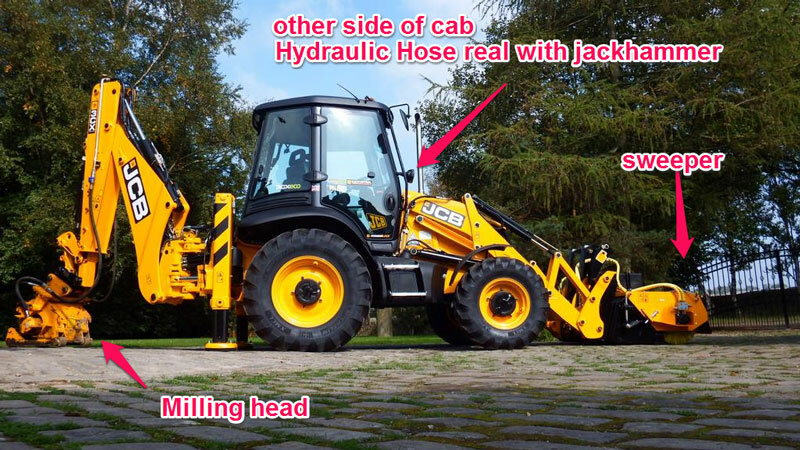 The new JCB 3CX Pothole Master offers far more. Imagine, one machine milling and repairing potholes in the entire town like this in one day! As a single-machine solution for permanent pothole repairs, this backhoe loader combines a powerful patch planer and sweeper shovel with the facility to operate handheld tools. HOLES can therefore clean, prepare and fix any pothole within any city or town and move onto the next one. But you’re never limited to road repair work – based on JCB’s versatile 3CX Eco backhoe, the Pothole Master can be used for a huge variety of year-round applications. Call (973) 458-1188 or email us to schedule a demo or speak with an expert technician.